Kat transformed in front of him. Her chin came up, her fingers stopped twitching with the fabric of her gown, and a real sparkle bubbled in her eyes. It was like watching Snow White come to life when the prince kissed her. 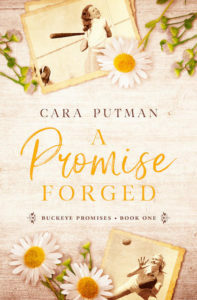 A heartwarming WWII historical from award-winning author Cara Putman: Kat Miller has dreamed of playing baseball her entire life. When she earns a spot on a team in the All-American Girls Professional Softball League, she finds that things aren’t as glamorous as she imagined. She struggles with long road trips, grueling practices, and older teammates who are jealous of her success. And to top it all off, an irritating reporter is constantly getting under Kat’s skin. Events in Jack Raymond’s career have left him cynical and distanced from God. He never wanted to write at a small paper, and he certainly didn’t want to be assigned to something as inconsequential as a women’s softball team. Then Kat walks into his life. The fiery, young softball player somehow climbs the walls around his heart and makes him want to hope again. When lies fly and the league appears to fail, will Kat and Jack’s new love survive? A Promised Forged is a charming story that effectively captures the flavor of WWII in the American Midwest. I am familiar with the All-American Girls Professional Softball League, but enjoyed experiencing the league through the eyes of one of its players. Kat and Jack are well-developed and interesting characters, but I struggled to relate to them – however, that may be a result of my being a few decades older. Slang from the era and periodic historic tidbits add dimension to the story. Jack’s struggle to reconcile his faith with the difficulties and unfairness of life is realistic without being preachy or contrived. Although they didn’t play large roles in the book, Kat’s parents were enjoyable characters. They obviously care for her, and the three have a close relationship. An easy read, I finished A Promise Forged in two sittings. I received a copy of the book for free from CelebrateLit Publicity, and a positive review was not required. All opinions expressed are my own. Since the time she could read Nancy Drew, Cara has wanted to write mysteries. In 2005 she attended a book signing at her local Christian bookstore. The rest, as they say, was history. There she met a fellow Indiana writer Colleen Coble. With prompting from her husband, Cara shared her dream with Colleen. Since those infamous words, Cara’s been writing award-winning books. She is currently working on book 30 and 31. 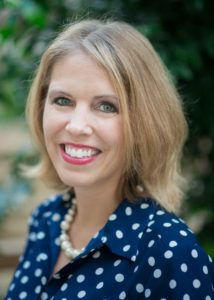 Cara Putman is an active member of ACFW, and currently serves on its Executive Board. She has also been the Indiana ACFW chapter president and served as the Area Coordinator for Indiana. Cara is also an attorney, lecturer at a Big Ten university, active in women’s ministry, and all around crazy woman. Crazy about God, her husband and her kids that is. She graduated with honors from the University of Nebraska-Lincoln (Go Huskers!) and George Mason Law School, and Krannert School of Management. You can learn more about Cara at www.caraputman.com <http://www.caraputman.com/>. Each of my books starts with a hook that engages my interest, and then as I play with it, I think it will engage readers. A Promise Forged was no different. For this book I was writing a series of three World War II novels for Barbour. I already had two historical hooks that fascinated me: children evacuated from London to Ohio, a top secret project to break Engima in Dayton, but I needed one more. I knew the lead characters were going to be siblings, but I wasn’t sure what to do with the kid sister. Then I remembered the All-American Girls Professional Softball/Baseball League. What would it have been like to desperately want a chance to play a sport you loved professionally? And to be part of the nascent league when no one was sure whether it was a good or bad idea? I decided that was the perfect place for Kat. She was the kid sister with fire and passion. She wanted a chance to prove herself, and this would be the perfect place. Then she needed a hero worthy of her. One who could go toe-to-toe with her and still see who she could be. He came in the form of Jack, a cynical reporter who is disappointed to be assigned to cover girls’ baseball. But then he gets to know Kat and some of the others. And he sees something in her that she doesn’t see in herself. It’s the beginning of fireworks that he doesn’t think can go anywhere because she has to go home to her senior year of high school. As I began researching the history of the league, I learned that the AAGPS/BL archives were kept at a small museum in South Bend, a couple hours from where I live. I spent a day there talking with the curator and exploring all the records. Because the league wasn’t expected to last there weren’t many records from the first year. That meant I had to guess about some things like schedules based on what happened in the years after. A Promise Forged became a book I loved writing. Kat was feisty, Jack was cynical, and baseball provided a great setting. I can’t believe this football loving woman can admit that! 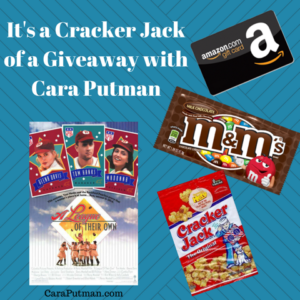 To celebrate her tour, Cara is giving away a grand prize that includes the movie League of Their Own, a box of cracker jacks, M&Ms and a $20 Amazon gift card!! Talkshow Thursday: Welcome Lauralee Bliss!